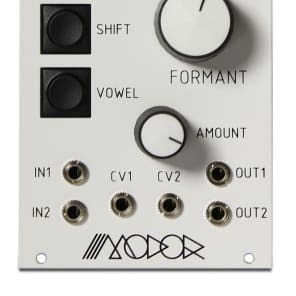 Modor's Formant Filter is a special filter that does a kind of 'vowel morphing' between three vowels. The big central FORMANT control is responsible for that, and of course there is a CV control (with attenuation) on this parameter. 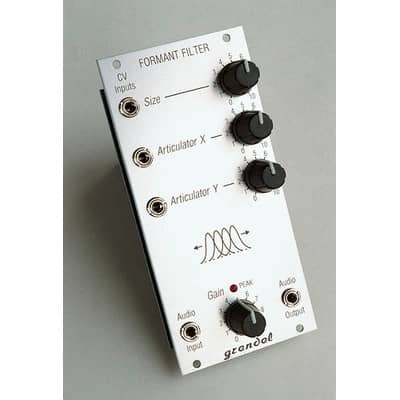 You can imagine a formant filter as a set of parallel bandpass filters, picking up and amplifying a set of small frequency bands. For example, with these frequency bands around 750Hz, 1200Hz and 2800Hz, you get the sound of an 'A'. So far, nothing special. There are more formant filters around composed of a set of parallel bandpass filters. That's what it does: morphing between different sets of formant frequencies, and that's why it sounds a lot more genuine vowelish than many other static bandpass combinators. There are 10 preset vowels, that can be selected with the VOWEL button: A-E-O-I-OE-U-EI-EU-AO-U-UI. The vowels of the Dutch language... :-) The 1-2-3-4 controls on top give you the possibility of composing your own vowels by manually adjusting the frequency bands. But watch out... ! Many users are very confused when touching the module the first time. The 10 preset vowels behind the VOWEL button are a lot of fun to play with already! Just start testing preset combinations in the 3 vowel slots (left-center-right). The 1-2-3-4 buttons are there to select formants to make user vowels, but at illegal combinations of these knobs, the filter crashes! 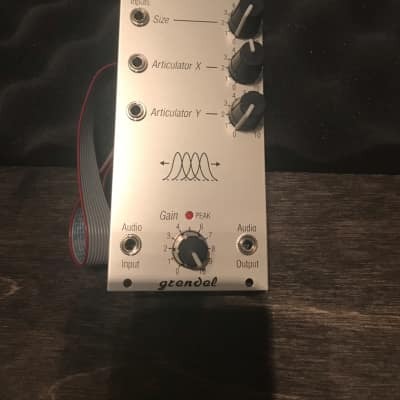 At first, play a bit with the presets (press VOWEL button) to get how the filter works, and then start slowly and cautiously to make adaptations with the 1-2-3-4 knobs (and SHIFT+1-2-3-4) - you'll hear how close good sounding vowels can be to the "forbidden zone" of filter crashing. Many people just start turning 1-2-3-4 to see what it does, thereby crashing the filter, unable to recover. 3. Turn the FORMANT knob full right and push VOWEL again to recall a third preset in the right vowel slot. Now the Formant Filter should be working, play around a bit with the FORMANT knob to hear the filter in action, or put a CV in the CV input and turn up the AMOUNT.